Synonimy: Stemonitis ferruginosa Batsch, Licea cylindrica (Bull. ) 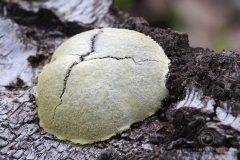 Fr., Licea fragiformis (Bull.) Nees, Tubifera ferruginosa (Batsch) J.F.Gmel., Tubulina cylindrica (Bull.) DC., in Lamarck & de Candolle, Tubulina fragiformis (Bull.) Pers. 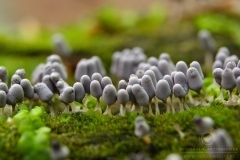 Synonimy: Arcyrella nutans (Bull.) 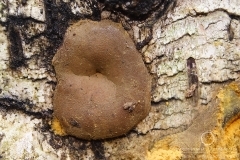 Racib., Arcyria flava Pers., Arcyria nutans (Bull.) Grev., Embolus obvelatus Oeder, Stemonitis nutans (Bull.) J.F.Gmel., Trichia elongata Schumach., Trichia nutans Bull. Synonimy: Aethalium septicum (L.) Fr., Aethalium vaporarium (Pers.) Becker, Fuligo septica (L.) J.F.Gmel., Fuligo tatrica Racib., Fuligo varians Sommerf., Mucor septicus L., Reticularia septica (L.) With. 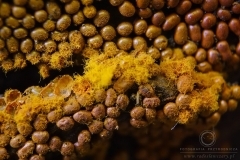 Synonimy: Physarum aurantium (Bull.) Pers., Sphaerocarpus aurantius Bull., Stemonitis aurantia (Bull.) J.F.Gmel., Tilmadoche mutabilis var. aurantiaca (Bull.) 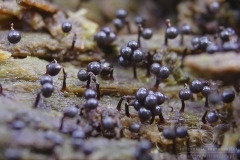 Rostaf., Trichia aurantia (Bull.) Raeusch. 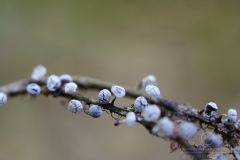 Synonimy: Physarum albipes Link, Physarum nutans Pers., Sphaerocarpus albus Bull., Stemonitis alba (Bull.) J.F.Gmel., Tilmadoche alba (Bull.) 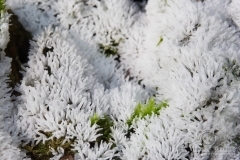 T.Macbr., Tilmadoche nutans (Pers.) Rostaf., Trichia alba (Bull.) Raeusch. 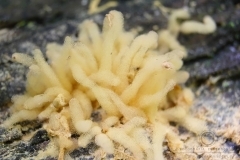 Synonimy: Chondrioderma exiguum Racib., Physarum nutans var. viride (Bull.) 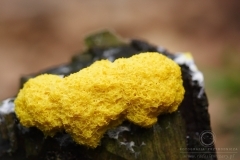 Fr., Physarum viride (Bull.) Pers, Sphaerocarpus viridis Bull., Stemonitis viridis (Bull.) J.F.Gmel., Tilmadoche mutabilis Rostaf. var. mutabilis, Tilmadoche viridis (Bull.) 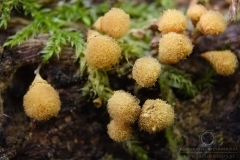 Sacc., Trichia viridis (Bull.) Raeusch. 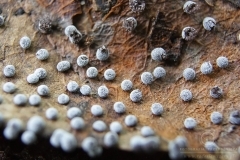 Synonimy: Enteridium lycoperdon (Bull.) 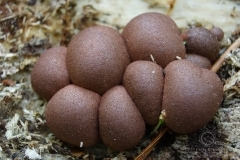 M.L.Farr, Fuligo lycoperdon (Bull.) 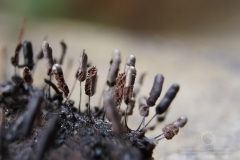 Schumach., Mucor lycogala Bolton, Reticularia umbrina Fr., Trichoderma fuliginoides Pers. 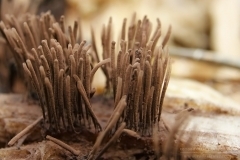 Synonimy: Arcyria rubiformis (Pers.) Massee, Hemiarcyria rubiformis (Pers.) 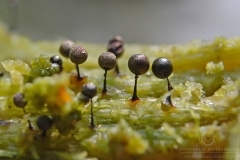 Rostaf., Hemiarcyria rubiformis var. 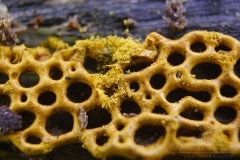 neesiana (Corda) Rostaf., Hemitrichia rubiformis (Pers.) Lister, Hemitrichia vesparium var. 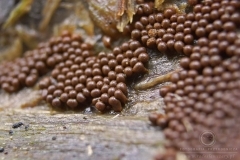 vesparium (Batsch) T. 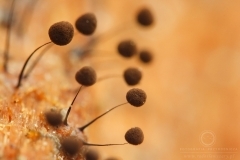 Macbr., Lycoperdon vesparium Batsch, Metatrichia vesparium (Batsch) Nann.-Bremek. 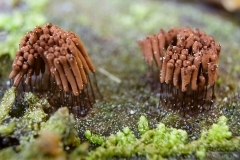 Synonimy: Trichia favoginea var. persimilis (P.Karst.) Y.Yamam. 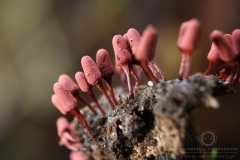 Synonimy: Clathroptychium rugulosum (Wallr.) Rostaf., Dictydiaethalium applanatum (Berk.) Rostaf., in Fuckel, Dictydiaethalium ferrugineum Nann.-Bremek., Enteridium japonicum Nann.-Bremek. & Y.Yamam., in Yamamoto & Nannenga-Bremekamp, Fuligo plumbea Schumach., Licea applanata Berk., Reticularia plumbea (Schumach.) Fr. 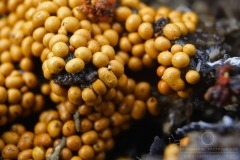 Synonimy: Arcyria decipiens Pers., Trichia decipiens var. decipiens (Pers.) T. Macbr. Trichia fallax Pers. 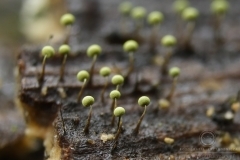 Synonimy: Stemonitis axifera var. smithii (T. Macbr.) 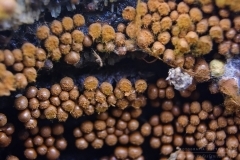 Hagelst., Stemonitis ferruginea var. 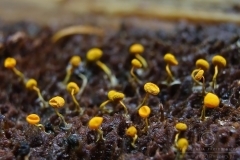 smithii (T.Macbr.) G.Lister, in Lister, Stemonitis ferruginea var. violacea Meyl., Stemonitis violacea Fr. Synonimy: Cribraria cancellata var. anomala (E.Jahn) Y.Yamam., Cribraria cernua Pers., Cribraria exilis T.Macbr., Dictydium anomalum (E.Jahn) Meyl., Dictydium cancellatum (Batsch) T.Macbr., Dictydium cancellatum f. anomalum (E.Jahn) G.Lister, in Lister, Dictydium cancellatum subsp. 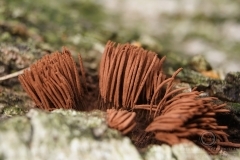 anomalum (E.Jahn) Meyl. 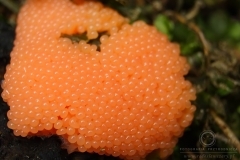 Synonimy: Byssus fruticulosa O.F.Müll., Ceratiomyxa caesia E.Jahn, Ceratiomyxa mucida (Pers.) J.Schröt., in Engler & Prantl, Ceratium filiforme Berk. & Broome, Ceratium pyxidatum Alb.& Schwein., Ceratium mucidum (Pers.) J.Schröt. Synonimy: Stemonitis ferruginea Ehrenb., Trichia axifera Bull. Synonimy: Comatricha friesiana (de Bary) Rostaf., Comatricha obtusata (Fr.) Preuss, Comatrichoides nigra (Pers.) 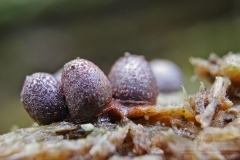 Hertel, Stemonitis atrofusca var. 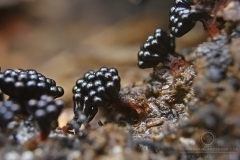 nigra Pers., Stemonitis friesiana de Bary, in Rabenhorst, Stemonitis nigra Pers. ex J.F.Gmel., Stemonitis obtusata Fr.